Searching around for new destinations, I came across some VERY eccentric and beautiful places that I hope to check out in my lifetime. 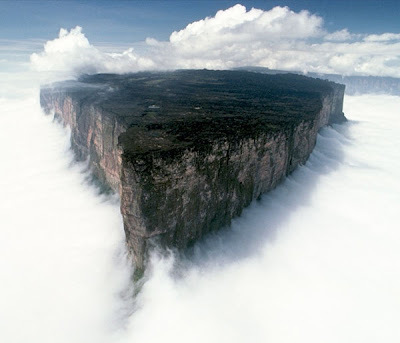 I love how big our world is sometimes. Looking like flora straight from Pandora, I was amazed to find out that there are 71 glowing mushroom species here on Earth. 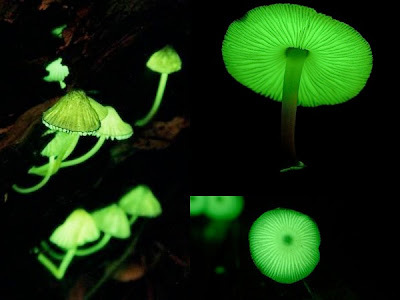 This one, found in the forests of Japan and Brazil, is called the Mycena chlorophos. They emerge during the rainy season, causing the floor to glow with spores. The light show generally happens in the late summer months, although the mushrooms only do really well where, not surprisingly, there are no people to disturb them. 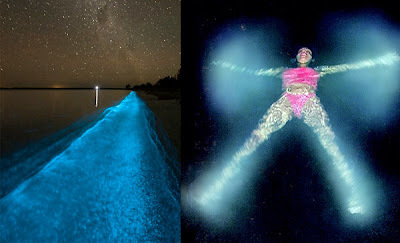 Glow in the dark water? Thanks to the fortuitous trio of luminescent waters called La Parguera, Mosquito Bay and Fajardo, the undoubtedly surreal experience of wading in up to 160,000 microscopic dinoflagellates per liter can be yours in beautiful Vieques, Puerto Rico. In certain part of New Zealand and Australia, travel underground and suddenly it appears as if the night sky has followed you. 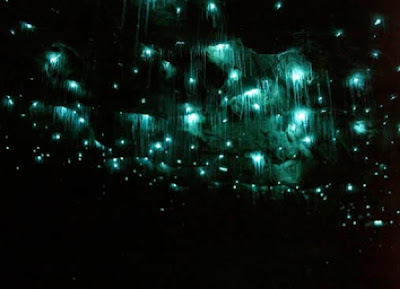 Thanks to common "glow worms", cave ceilings are turned into stunning bioluminescent points of light. Actually, they're not actually worms, but larvae of the gnat fly. They spin a nest of silk on the cave ceiling and then hang down as many as 70 threads with drops of mucus (delicious) attached to snare prey. The larva all glow (even more brightly if they haven't eaten in a bit) to lure victims to the threads. Incredibly, nearly 100% of the energy input is turned into light. Incredible.